BotryProt (MS) is a mixture of nutrients and growth factors for the microflora made from specific microorganisms being able to prevent fungus growth and development. BOTRYPROT (MS) is a specific product that acts by contact to control rots. It can also be used as a bioinductor of self-defenses. 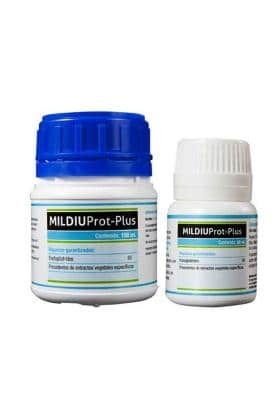 EFFECTS: BOTRYPROT (MS), among other effects and since it has nutritional properties it is able to activate the plant enzymes promoting their own defense mechanisms thus being regarded as curative/preventive product. BOTRYPROT (EM) is also able to improves the quality and quantity of the harvest. This product is fully biodegradable, non-toxic not affecting flowers or resins. APPLICATIONS: BOTRYPROT (EM) acts as phytofortifier against fungal attacks like Botrytis and Sderotinia that usually cause rotting (in flower) thanks to caterpillars and temperature drops. BOTRYPROT (EM) can be mixed/combined with PIREPROT and Azaprot to prevent the rot and caterpillars appearance at the same time. This product is suitable for outdoor, indoor and greenhouse cultivations. It leaves any residues. For Marijuana crops leave it for 8-10 days on outdoors and for indoor and greenhouse cultivations leave it for 12-15 days depending on weather conditions. Suitable for organic farming and integrated pest management.